There are 15 blog entries for March 2011. Wednesday, March 30th, 2011 at 3:29pm. Tuesday, March 22nd, 2011 at 11:46am. Cash buyers are becoming common. The number of homes bought with cash jumped to 32 percent in January compared with 26 percent a year earlier, according to the NATIONAL ASSOCIATION OF REALTORS. Read the rest of the article, "We Paid Cash for Our Million Dollar Home", on www.CNNMoney.com. Monday, March 21st, 2011 at 2:47pm. The Dallas-Fort Worth market added 63,600 jobs to the area between January 2010 and January 2011 — placing the region as No. 1 in job gains among U.S. metropolitan cities. A total of 266 metropolitan areas gained employment during the year, according to information released from the U.S. Bureau Labor of Statistics. Houston came in No. 2 with 56,600 additional jobs in the market. Friday, March 18th, 2011 at 12:44pm. Last week's earthquake and tsunami in Japan has been a sobering reminder of just how precious life really is. Our prayers go out to the people in Japan who have been affected the most by this event. Thankfully, the effects of the tsunami on Oahu and throughout Hawaii were minimal. Thursday, March 17th, 2011 at 11:40am. Owner has never seen, used or lived in this like new condo! She paid close to $1.8m for the unit brand new, with no discounts or credits given at purchase, and has now dropped her price from $1.7m to $1.49m. This is one of a few three-bedroom, view condos, located in one of only three new buildings in Waikiki. Don't miss taking a look at this gem! Tuesday, March 15th, 2011 at 12:17pm. According to www.luxuryhomemarketing.com, they've been seeing some interesting trends in the luxury market recently." "Median price for active listings at the top of the market saw a strong downward trend beginning at the end of February. This trend broke in September and we have seen general price stability since then as illustrated in the horizontal trending in the chart above. Keep in mind that this is based on active listing data and that the changes may reflect both the nature of the inventory coming onto the market (e.g. more larger and more expensive homes) and/or the relative level of pricing or discounting." Friday, March 11th, 2011 at 11:06am. 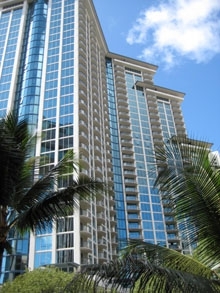 One of my favorite and most recent new developments in the heart of Waikiki, is Waikiki Beach Walk, literaly two or three blocks of mixed retail and restaurants, along Lewers Street and anchored by the Trump Tower Waikiki Hotel and Condos and the Royal Hawaiian Shopping Center, another personal favorite. 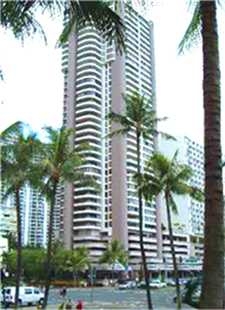 Read more about Waikiki Beach Walk and visit their website. Thursday, March 10th, 2011 at 11:07am. Wednesday, March 9th, 2011 at 1:00pm. According to the National Association of Realtors, homes sold at an annual rate of 5.36 million in January, up 2.7% from December and 5.3% higher than January 2010 sales. At the same time, the median home price fell 3% to $158,000, compared to a year earlier. It was the first time in seven months that the monthly sales total was higher than the year before. "The up trend in home sales is consistent with improvements in the economy and jobs," said Lawrence Yun, NAR's chief economist. The report was slightly stronger than expected. Tuesday, March 8th, 2011 at 10:23am. According to CNN Money Report, and as reported in the "Seattle Post Intelligencer" newspaper and blogs, "Luxury Real Estate Sales Up in All 20 U.S. Metros", "with some cities seeing an 18.6 percent increase in high-end home sales, according to DataQuick Information Systems. The increase follows four consecutive years of declines in million-dollar homes." "The market that fared the best in high-dollar real estate: San Jose, Calif., which boasted a 27.4 percent increase in sales last year in million-dollar homes. Honolulu also saw a big spike in million-dollar sales - a 26 percent increase - as well as New York, where million-dollar home sales rose nearly 25 percent."